Welcome to Spirit Aviation. We are your full service FBO offering the finest executive terminal services and top notch Cessna Pilot Center and Thomson Flight School at the Thomson McDuffie-Regional Airport. Download the NOTAM Final Masters 2018 – Coming Soon!. 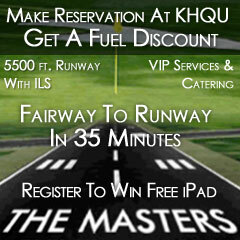 Download the FAA Masters Slot Information. Our antebellum style terminal has a large conference room, pilot lounge and a snooze room with showers as well as the latest in weather and flight planning. For your safety, a fire station and EMS facility is also located on the field. Our uniformed NATA certified staff are ready to meet all of you aviation needs. Spirit Aviation also has the best hangar rental space in the Thomson-Augusta area. McDuffie County has the lowest ad valorem tax rates on aircraft in Georgia. If you’re interested in Thomson – Augusta hangar rental, contact us today at 706-595-1300. As a Cessna Pilot Center, Spirit Aviation is the premier Thomson – Augusta flight school for the Augusta area. With the Cessna pilot training program and Cessna qualified, professional flight instructors, your flight training will be completed 25% faster than the national average. You’ll enjoy flying and feel safe in Spirit Aviation’s fleet of late model Cessna 172 Skyhawk and brand new Cessna 162 SkyCatcher aircraft. Spirit Aviation also offers sport pilot and private pilot certificates as well as advanced pilot training including the instrument rating and commercial pilot certificate. In addition, you can make your training even more affordable with the hot off the assembly line, Cessna SkyCatcher light sport aircraft while working towards either your private pilot or light sport certificate.